Southwest Florida's Gulf Coast is home to some of the most spectacular private estates and waterfront properties in the United States today. 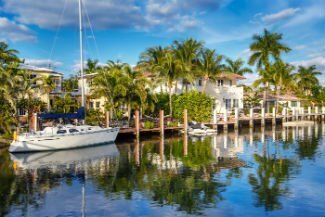 Tucked into sun-drenched inlets and surrounded by lush tropical vegetation, Southwest Florida luxury real estate is much sought-after by discerning homebuyers who value dramatic locales and who lead even more dramatic lifestyles. Whether you're an ardent golfer on a quest for the perfect green or you're looking for a short walk from your yacht to your doorstep, you'll find a host of expertly crafted lifestyle homes across the region. Ranging from surprisingly affordable to unapologetically opulent, these estates are not to be missed. Browse the finest Southwest Florida luxury homes for sale below, or read more about the life that awaits you along Florida's Paradise Coast. From Naples to the south to Fort Myers to the north, Southwest Florida luxury properties feature stunning, award-winning architecture and take full advantage of the region's enchanting combination of warm beaches, inviting blue-green waters, and unbelievable weather. From Polynesian-style tropical retreats overlooking Collier Bay to Tuscan-inspired villas within walking distance of Quail West Country Club, these exclusive properties cater to a select variety of buyers. Chances are that whatever you like to do, though, there's a custom estate in the area for you. What's immediately striking about the most desirable Southwest Florida luxury properties is a union of elegance and comfort. Starting at $2,000,000, these homes feature a meticulous attention to detail when it comes to their construction, design features, and finishes. It's not uncommon to find homes with four to five bedrooms that feature ensuite baths throughout, large professional kitchens, and extraordinary outdoor living areas that complement the Floridian love affair with the sun. Indeed, elegant spiral staircases, soaring cathedral ceilings, and floor-to-ceiling walls of glass help complete the sense that you're living in a tropical palace. Near the heights of the Southwest Florida real estate market, you'll discover ultra-luxury estates that are some of the finest homes on the continent today. Typically sitting beside beaches or on sprawling, park-like grounds, these ultra-luxury estates aren't just homes—they're personal seaside resorts. Each of these alluring homes has been custom constructed by renowned architects to suit the needs of incredibly successful people. Because these homeowners are rightfully demanding, their former homes feature a truly astonishing array of amenities and are situated on the most idyllic locations that Southwest Florida has to offer. On the hunt for the conveniences of condominium living with a touch of class? Or would you like to wake up to breathtaking views of the Gulf? The waterfront condos of Southwest Florida break all the rules with generous square footage, incredible vistas, and all of the meticulous interior designed features you'd expect of a traditional detached estate. These incredible homes in the sky make up the penthouses and upper floors of the region's finest buildings. Residents enjoy not only great lakefront and beachside locations, but also the amenities that these buildings offer, including private terraces and swimming pools, fitness centers, beachside cabanas, and community barbecues. For professionals and amateurs alike, it's exciting to learn that Naples is the "Golf Capital of the World." In fact, as one of the country's top golf destinations, it features dozens of mastercrafted dream homes that are designed specifically to enhance a golf-oriented lifestyle. These luxury golf estates offer all of the sophisticated features and amenities that residents have come to expect of the very best Southwest Florida real estate, but they're frequently situated just steps from the region's exclusive courses. These include a number of must-play clubs—like Tiburon, Old Corkscrew, and the TPC Treviso Bay—that have been revered by Golf Advisor and Golf Magazine. Looking for the most exclusive Southwest Florida luxury homes for sale? Get in touch with Kevin Yankow and Key Real Estate for expert guidance in finding the perfect match for all your real estate needs.